Joseph Howe was the leader of the Reform movement in Nova Scotia in the 1830s. He had little formal schooling, but was self-educated because he used his reading ability to further his knowledge. He bought a Halifax newspaper, the Novascotian, which became very influential and allowed Howe to report on the conduct of the small merchant oligarchy that controlled government in Nova Scotia at the time. Howe argued that since Great Britain had responsible government, the colonies ought to have it, too. The Reformers won the election of 1847 on that issue and Nova Scotia became the first British North American colony to have responsible government. 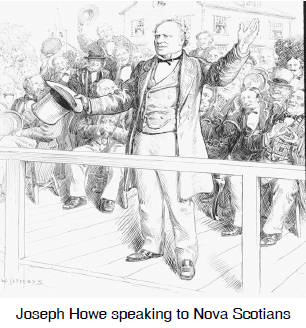 Joseph Howe opposed the idea of joining Confederation because he thought Nova Scotia would just become a second-class partner in the larger union and lose its special identity. He also thought the voters should be consulted before such a major step was taken. Howe had a lot of support for this view and the premier of the day, Charles Tupper, pushed to have Confederation passed before he had to face an election in 1867.